Will PandaPow Wifi router solve your multiple device protection problems. PandaPow WiFi is a product from a service that is based in Hong Kong. The company says that its products offer the easiest way to use a VPN service anywhere on the planet. And you can rest assured we’ll try to test that assertion in this comprehensive PandaPow WiFi review. PandaPow WiFi has gained a decent amount of media attraction and that gives us some clues on how good the service really is. Not many have questioned the company’s claim of providing an easy-to-understand method of connecting to a VPN service. Our research for this PandaPow WiFi review tells us that it does have some range issues. Other than that, we think that PandaPow WiFi is indeed intuitive to use and to operate. 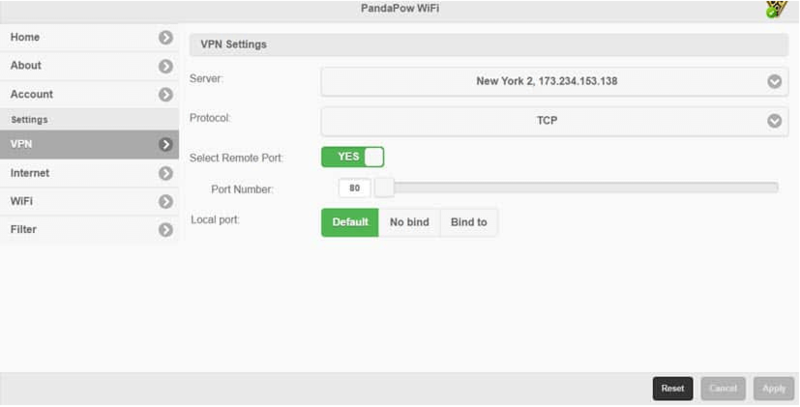 If you have never used a WiFi VPN router before, then PandaPow WiFi may present an easy option for you. Even though the whole kit looks smart, PandaPow WiFi isn’t perfect. Admittedly, we always give extra marks for presentation. But if a product doesn’t have the necessary functions, features, and performance to back up that presentation, then it loses credibility. The thing about VPN services is that, VPN encryption is a process that requires a lot of memory and processing power. In other words, it is a hardware resource intensive service. If you want to make sure that your VPN service does not interfere with your internet speed then you need to have sufficiently powerful hardware. But it doesn’t have that raw processing power that we think is necessary for a VPN enabled router. And because of that, PandaPow WiFi performs rather poorly when it comes to the overall web experience. By now you already know what you are paying for? 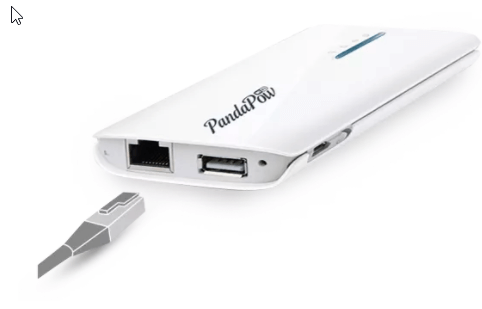 PandaPow WiFi is a device that the company behind it likes to call a portable VPN router. To subscribe to PandaPow WiFi you will need to pay around $99 per year. Moreover, currently the company behind PandaPow WiFi is also offering a free extra three months subscription with a purchase of its year long subscription package. When you pay $99 to the company behind PandaPow WiFi, you get a free router. And a subscription for a full year. Basically, you are paying the company for the VPN service. Well, that comes for free. If we do a bit of math and calculate the sum of money it will cost you per month, then that comes down to $6.60 per month. This is what you pay for the first year. As far as the years after that are concerned, the rates change. You will have to pay $8.25 per month after your first year. But PandaPow isn’t just about VPN routers. It has other packages as well. PandaPow also has a software-based VPN subscription plan. The company calls it the classic plan. We’ll talk more about PandaPow VPN service in another review. This is the PandaPow WiFi review. So why did we mention PandaPow Classic VPN service if this is a PandaPow WiFi review? Well, the reason we have mentioned it here is that there is a really good value for money offer that PandaPow is offering to new users right now. For a limited time period, you can have PandaPow WiFi and PandaPow Classic VPN service as a combo package. And you can have all of that for just $149 per year. As before, PandaPow will also throw in three months of free extra service. If you want to sign up for PandaPow Classic on its own then that will cost you around $9 per month. If you subscribe to the same PandaPow Classic service for a period of a full year then you will only have to pay $7 per month. As far as features go, PandaPow WiFi doesn’t really have anything special. But it does do a good job of ensuring that users have all the standard features available. That’s All Great. But What About Number of Devices Per Device? Since this is a full blown router you are buying, PandaPow WiFi will allow you to connect an unlimited number of simultaneous devices with just one account. You can connect as many as you want. And at once too. This is the biggest reason why some people like to install VPN services on their routers. With a VPN-installed router in place, any device that is connected to the internet via the router is automatically protected via the VPN service. You don’t even have to install anything on your device. Having a VPN service installed on a router is great for many reasons. The chief reason among all the reasons is that it saves you a lot of time if you want to use a VPN service for all of your devices. A VPN-enabled router enables you to protect devices that normally do not support any kind of VPN services. Even if your device does not support any VPN installation, you can still protect it if you connect it to a router that has VPN service installed on it. What Type Of Devices Don’t Support VPN Services? You have to take into account the fact that different people like to work with different devices. Just because you don’t have a device other than a laptop or desktop or a smartphone or even a tablet, doesn’t mean that the rest of the world doesn’t have one either. We know a lot of people who use devices such as gaming consoles and Smart TV sets for their streaming needs. As you can probably imagine, these type of devices don’t have any support for VPN services. And this is where a VPN-enabled router can just come in and protect everything in sight. And not to mention very convenient. The official website will tell you that PandaPow has VPN servers located in about eleven countries. However, if you only have the router interface available then you can only access nine of these servers. 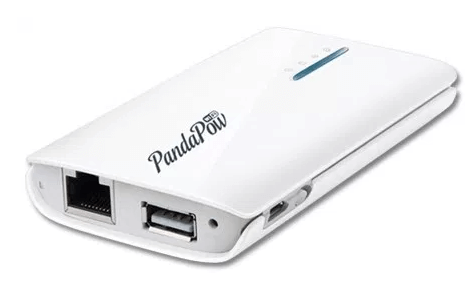 On the outside, the PandaPow WiFi really looks like something that one would label as a portable VPN router. Moreover, it is very compact. You can easily hold it in your hands. And we imagine, not too many people would have problems storing this device in their backpacks or even pockets either. So how do you go about connecting your devices with this VPN-enabled router? Well, all you have to do is connect your devices to the router via Wifi. People who are into gaming or just want better latency rates along with downloading speeds can also make use of wires with PandaPow WiFi. PandaPow WiFi has ports for wired LAN connection as well. All you have to do is take a LAN cable. Plug one end of it into your device. And the other end into the PandaPow WiFi router. Again, you can connect all your devices with Wifi to PandaPow WiFi router. How Does PandaPow Wifi Router Connect To The Internet? The answer is rather straightforward. It uses a wired LAN connection to connect to your internet connection. All you need to do is take your internet connection LAN wire and plug it in right into your VPN-enabled router. PandaPow WiFi can also connect to your current router via WiFi. It also supports connection through a USB modem. It can support transfer rates up to 150Mbps via its IEEE 802.11 b/g/n set of media access controls. As you can probably tell that PandaPow WiFi doesn’t have what you would call impressive hardware. We know a lot of VPN routers that ship with much superior hardware specifications. A great example is Betterspot VPN router. But we won’t talk about that in this PandaPow WiFi review. Do Hardware Specifications Matter for A VPN-Enabled Router? Otherwise, why would we even talk about it? We’re not trying to complete a vanity project where we have the most superior hardware in town. As we will detail in the rest of this PandaPow WiFi review, lower hardware specifications definitely hit the router’s performances in various categories. 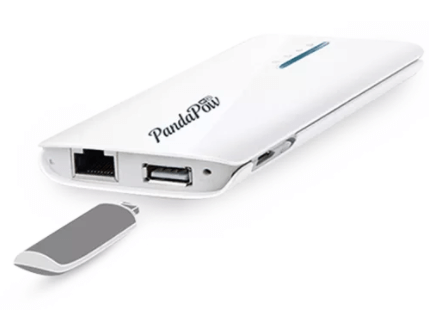 PandaPow WiFi does come with a USB-rechargeable battery. This is something we haven’t seen in many VPN routers. And of course, a rechargeable battery is great news for VPN routers because it can add to their portability. That is also the reason why we think that PandaPow WiFi, though may not have the best hardware specification, is truly a portable VPN router. Of course, any VPN router has to back these features up with performance. And as you will come to know in the later portions of this PandaPow WiFi review, the rechargeable battery does not do PandaPow WiFi any good. Because it is simply not good enough in many other areas. We don’t want to spoil anything for you, but PandaPow WiFi will test the limits of your patience. And hence, by the end of using PandaPow WiFi for the first time, you wouldn’t really care if it has a rechargeable battery pack or not. PandaPow WiFi comes in white. And by that we mean, it comes in all white. We’re not going to judge anyone here because we know a lot of people who have a soft spot for white hardware. However, because of its shiny and white looks, PandaPow WiFi, as a router, looks fantastic. As mentioned before, it has a sleek design and the whole device feels very compact. You can easily slip it into your jeans pockets regardless of the pocket’s thickness or size. With that said, we also have to say that the plastic that is used on its entire body feels cheap. Of course, that does not affect the robustness of the device itself, but still. If you are paying close to $100 for a router, the company should make sure it uses appropriate materials to make the actual product. However, that doesn’t mean PandaPow WiFi will break easy. We expect to perform well even when knocked here and there or even when it is dropped. Of course, if you are going to carry the thing around with you on a regular basis, then it must have the required sturdiness. PandaPow WiFi has that sturdiness about it. Hence daily scrapes won’t hurt it one bit. As mentioned before, PandaPow is a company that is based in the region of Hong Kong. Hong Kong doesn’t have any of those mandatory data retention regulations and laws. The official website says that the company does not, under any given circumstance, store any kind of private information about their customers or their activities via their network. The company also states that it does not keep a record of its user’s emails, VOIP calls, chats or even the websites they visit on a regular basis. But that does not mean that PandaPow has a zero-log policy. It only means it does not keep usage logs. It does keep connection logs on its users. Connection logs contain information about the metadata that each user generates. The company says on its official website that they do store your personal information. The total amount of data that a user transfers in any given session. But all of that isn’t a deal-breaker. Because PandaPow is located in Hong Kong. This means, notorious spying agencies like the NSA, CIA, and MI5 or MI6! cannot interfere in Hong Kong because of jurisdiction restrictions. What About P2P Transactions? And The Company’s Policy On Copyrighted Material? From what we have researched so far for this PandaPow WiFi review, we have come to know that the company does not appreciate P2P transfers of any type. If the company receives complaints about a user downloading copyrighted material like movies and music files via the company’s network, then they may take measures in order to protect themselves from possible legal actions on their VPN service. You can’t use P2P file transfers with PandaPow. PandaPow WiFi uses a VPN protocol that is based on the SSL technology. The company says that they use the same SSL VPN protocol in all their VPN-enabled routers and VPN apps. It can prevent any form of detection on behalf of the users. Moreover, it allows the user to bypass many content-blocked websites. Some VPN protocols aren’t strong enough to withstand extreme pressure from hackers and government agencies. But any SSL based VPN protocol should prove as sufficient for the average user. Strangely enough, PandaPow WiFi official sources say that it does not use OpenVPN. If you ask their representatives, they say that they use a proprietary VPN protocol. Some clever reviewers though have searched the configuration files for PandaPow Classic VPN subscription plan quite comprehensively. And they have found out that PandaPow does not use a proprietary VPN protocol. In fact, it uses the suspected OpenVPN protocol. Why would the company want to hide this fact? We don’t know other than the fact that the company wants to give naive users the impression that it is resourceful enough to come up with its own VPN protocol. The same goes from the company’s Windows client as well. It uses a custom build though. What Does The Company Mean When It Says, Its Product Enables Users To Avoid Detection? Company representatives would tell you they would not like to talk about ways an entity can sabotage their encryption efforts. The company also says that they know a lot of people and services want to block their service. If you further press them, they would tell you that their service has survived a number of years as a successful VPN service while their competitors have faced many problems in the same areas. Of course, no one apart from the company can give a definitive answer. But our guess involved the company using OpenVPN connections that are just routed over the regular TCP Port 443. A blowfish 128-bit cipher along with RSA 2048 bit handshake and HMAC SHA-1 for hash authentication. All of these are basically OpenVPN settings. In other words, PandaPow WiFi uses OpenVPN connections and not its own proprietary VPN protocols. PandaPow also claims that the company implements perfect forward secrecy. We can’t say we’re surprised to know that. Because the latest official version of OpenVPN, OpenVPN 2.4.0 also implements perfect forward secrecy. What About The Windows Client? The Windows client also uses OpenVPN. But more specifically, it uses the 2.3.11 version of OpenVPN. In other words, PandaPow Windows client uses OpenVPN 2.3.11. And that also means it does not implement Diffie-Hellman or even ECDH keys. How are we sure about that? Well, if you aren’t sure you can just go ahead and view the config files for their Windows client. All of this also means that PandaPow Windows client does not use perfect forward secrecy. Needless to say, this configuration is not strong. It may suffice casual users or new users, but not if the user is concerned about his or her privacy. Moreover, we feel, this configuration does not give the user proper and secure VPN connection. Such configurations aren’t resistant to the many types of cyber attacks as well. PandaPow will tell you that they are continuously trying to add more options for stronger encryption implementations such as AES 256 bit. Unless that actually happens, we feel PandaPow does not have strong enough encryption. What About The OFficial PandaPow Website? The official website doesn’t give you the feeling that it is visually polished. Regardless, you should have no problems in navigating the official website. THere is a dedicated FAQ section for users with questions. But most of the questions are geared towards users who are new to VPN services. There is also an official blog. This blog updates readers on all the latest developments at the company. PandaPow only provides support with live chat and a ticket email system. Of course, live chat is always subject to proper timing. So if you live in the UK and want to contact the company, which is based in Hong Kong, then make sure you do so at proper times. Otherwise, you will never get to connect to their live chat feature. PandaPow also provides customer support via phone. You can dial their Hong Kong based number. But remember, international calling rates will apply. Don’t expect PandaPow customer support staff to give you a comprehensive reply within hours. Expect them to take at least a day. And if you want details or more clarifications, then expect them to take up to two weeks for a response. If the company wants to improve its ratings across the web, then it has to do more when it comes to replying to customer questions. Our research for this PandaPow review tells us that their customer support is not great. They don’t give complete answers and sometimes give the user inaccurate answers. We can’t say they do so deliberately. For the purposes of this review, the installation process also includes the signup process. The signup process is painless. You can pay via credit card or debit card. All payment options have the auto-recurring options enabled from the start. Unless you cancel your subscription explicitly, you will continue to receive PandaPow bills. You can also pay the company with Bitcoins by using Coinbase. Of course, there is no point in paying for a VPN-enabled router with Bitcoins. Because you have to give them a physical address in order to receive the shipped VPN-enabled router. 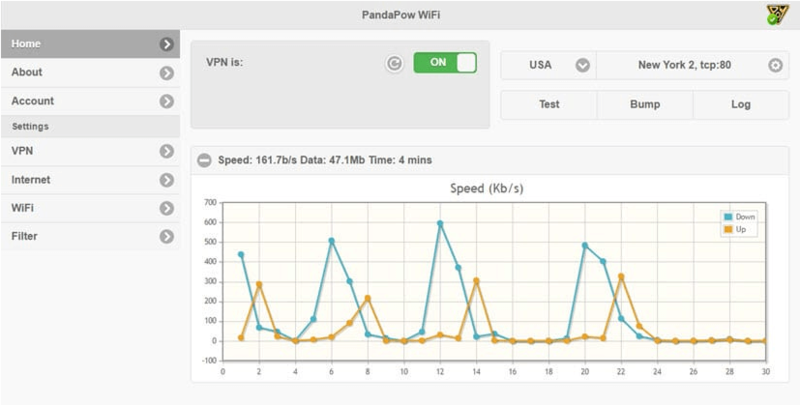 PandaPow WiFi follows the industry trend where it uses a web-based interface. You can manage everything from your web browser, in other words. All you have to do is log in to the company’s webpage and then input your credentials. The company will provide you with the related URL for this task. The web interface has a dedicated page for VPN settings. You can go to this page and manually select remote ports among many other options. As mentioned earlier in this PandaPow WiFi review as well, you can filter the VPN connection by web pages as well. And you can even filter by the device used. As alluded to before, PandaPow WiFi web interface is intuitive to use. It comes packed with some genuinely useful VPN features. The most useful of them all is, of course, the filtering option. As far as PandaPow WiFi is concerned, it can only use the 2.5 GHz band. And it can reach a theoretical maximum transfer rate of 150 Mbps. To test it for WiFi performance, one has to compare the internet’s download and upload speeds. One has to do it two times. The first time, without the user of the PandaPow WiFi router. And the second time with it. In other words, you have to perform speed tests two times. First, you must only use your regular router or modem and after that perform the test one more time with PandaPow WiFi router directly connected to your default router or modem. As mentioned before, you can connect PandaPow WiFi to your router via a simple Ethernet cable. You may also perform a third test where you connect PandaPow WiFi router with your default or standard router with WiFi instead of a cable. As mentioned earlier as well, we think PandaPow WiFi has some significant range issues. The service it provides is not stable enough at even normal ranges. You have to bring the PandaPow WiFi router quite close to your machine in order to get it to work. Moreover, don’t expect a fast connection every time you connect to PandaPow WiFi. How To Test Your Product’s Performance? You can use any service from a ton of speed testing online services and apps. For example, you can use the Wifi Speed test application for your Android system. And you can always go to sites like speedtest.net and speedof.me to do the same for your desktop computer. Reviewers usually try to place their devices close to the router for best results. Our research for this PandaPow WiFi shows that the VPN-enabled router is considerably slower than the standard router. But VPN-enabled routers don’t usually come with the option of a connection to a regular router via Wifi. So bonus points for PandaPow for this feature. This is where we will specifically use PandaPow WiFi router and not the standard router. You can connect the router to the internet with the help of an Ethernet cable. And then connect your computer to the PandaPow WiFi router via a WiFi connection. This will ensure that you get the best results possible. Our research for this PandaPow WiFi review, shows that it will decrease your download speed by a mammoth 90 percent. Of course, this is not acceptable. But perhaps we should have expected that. Because PandaPow WiFi did have rather limited hardware capabilities. PandaPow WiFi does protect users against WebRTC and IPv4 leaks though. In other words, it stops your machine from revealing its out facing IP address. Does PandaPow Work With Netflix? Just connect to the right server and you’re ready. Of course, the speed results above should give you an indication that your streaming experience will suffer. Unless you like buffering stoppages. As mentioned before, you can connect any of your WiFi-enabled devices to PandaPow WiFi router. PandaPow Classic VPN subscription plan has dedicated clients for Windows as well as Mac OS X. The company also has apps for OS X and Android. We’ll talk more about this in another review which will focus on PandaPow Classic VPN subscription service alone. The VPN-enabled router has good presentation and sturdiness. Is compact and should fit into your pockets. We mentioned this in the beginning as well, that PandaPow WiFi is quite small for a VPN-enabled router. The device has poor hardware specifications. And that affects its speed. Similar VPN-enabled devices offer much more in terms of performance and hardware specifications. We don’t think we have come across a VPN-enabled router which has worse performance than PandaPow WiFi. It has horrible speed statistics and range issues. If you want to use a VPN-enabled router on a daily basis then PandaPow WiFi is not it. What good is PandaPow WiFi when it decreases your internet speed by up to ninety percent. Yes, it does have a rechargeable battery and is very easy to use. But we can’t recommend it anything above as a secure router for your travels. Again, we might not even do that because it has extremely limited range. This will make it difficult for anyone to connect to the majority of public WiFi hotspots. In short, PandaPow WiFi isn’t a scam but terribly impractical solution. We regret that you had to endure this. Hopefully more users will start to come up with their own experience and force PandaPow WiFi to improve their service. I’ve actually had quite good experiences with the customer support. I have only contacted them through email though, but they have helped me out each time. We’re glad that you had a good customer support experience. However, consistency is the key here. Maybe you were one of the lucky ones. Then again, maybe you weren’t.